This recording focuses on ragtime’s greatest pathbreaker, Scott Joplin. 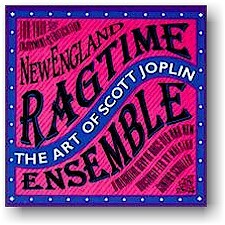 These rare orchestrations have been exhumed through the tireless efforts of ragtime curators, archivists and scholars such as William Russell, Vera Brodsky Lawrence, Richard B Allen and the Archive of New Orleans Jazz, then brought to life by the extraordinary performances of Schuller and his talented young group. Eight of the rags are performed in their original orchestrations, while four hitherto unorchestrated works are heard for the first time in instrumentations by Schuller. This is Joplin at his towering best, astonishingly foreshadowing developments in the jazz of later years, presaging Ravel’s sophisticated treatment of waltz rhythms, and influencing everyone from Debussy to Ives to Stravinsky to Jelly Roll Morton and others. Recorded on 15-17 December 1973 and 4 January 1974 in Jordan Hall at the New England Conservatory of Music in Boston, Massachusetts.